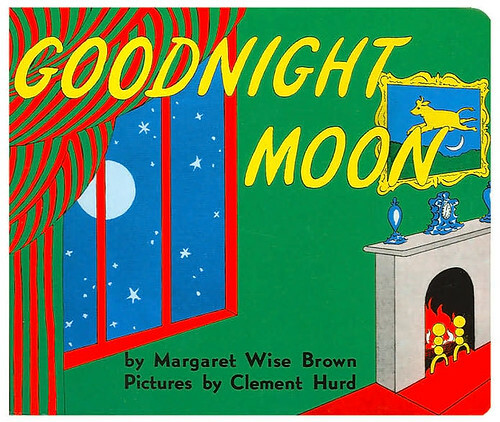 Margaret Wise Brown's Goodnight Moon is far and away the book I enjoyed reading to my children most. Those beautiful illustrations by Clement Hurd, that gentle prose... For years my kids fell asleep to this book, it was a staple. At some point over the past year or so, my youngest outgrew Goodnight Moon. I no longer read it, and it breaks my heart. This entry serves absolutely no purpose except to allow me to reproduce those words here, without permission from the copyright holder. I still have my copy for when I was a kid. I have a 2.5 year old and and a 6 year old and I usually pause after .."and a little old lady whispering..." so that they can finish the sentence with "hush". I am sure you are the same but it's to the point where I don't even need the book to tell the story. I am shocked....shocked I tell you! You didn't mention Kima and Elijah using Goodnight, Moon to say good night to the citizens of Baltimore!